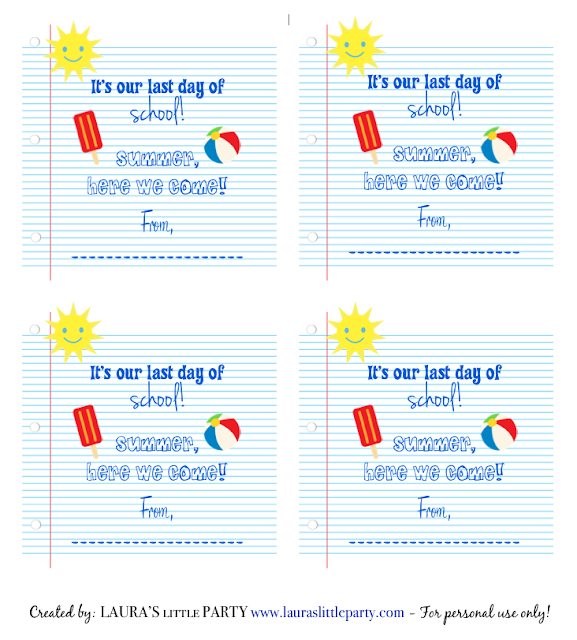 End of School Tags| FREE printables! I love this time of year! I love when all my kids are home for Summer break - even if they do drive me batty before 11am. There's something about not having to do the school lunch prep, and morning drop-off that have me all giddy! My 1st grader has only 3 weeks left of school. This school year has flown by! I'm currently decorating the cafeteria with the other PTA moms - we've planned an 80's themed school dance! Last year, for my little guy's last day of school, I created small favor bags of bubbles, a water gun, and a splash ball for all his classmates. He was so excited to hand them out, and the kids really enjoyed receiving a little parting gift. I created these fun tags and I'd love to share them with all of you! All you have to do is print them out! Punch a hole at the top or attach them with fun washi tape! 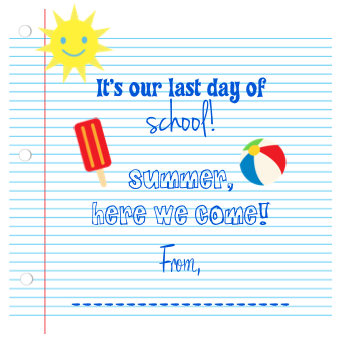 Click here to print out your End of School Tags!